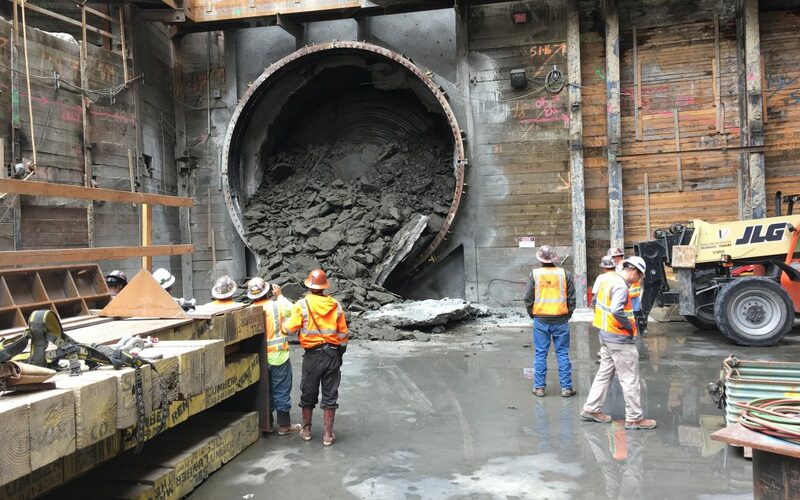 A giant tunnel-boring machine this week punched through the wall of a future transit station 110 feet below the busy streets of Los Angeles, a key milestone in the city’s $1.55 billion Regional Connector Transit Project. Twin 1.9-mile long rail tunnels will link three new stations along the Connector’s expanded path from Little Tokyo to the Financial District. The tunnels are scheduled for completion early next year, and the full project in 2021. The 1,000-ton, 450-foot long machine, nicknamed “Angeli,” simultaneously digs, builds circular concrete to shape the tunnels and lays train tracks at a rate of 50-feet per day while excavating 1,300-tons of soil. The 1,440-foot journey from Little Tokyo to the new Bunker Hill station began in March. More details at the project website.